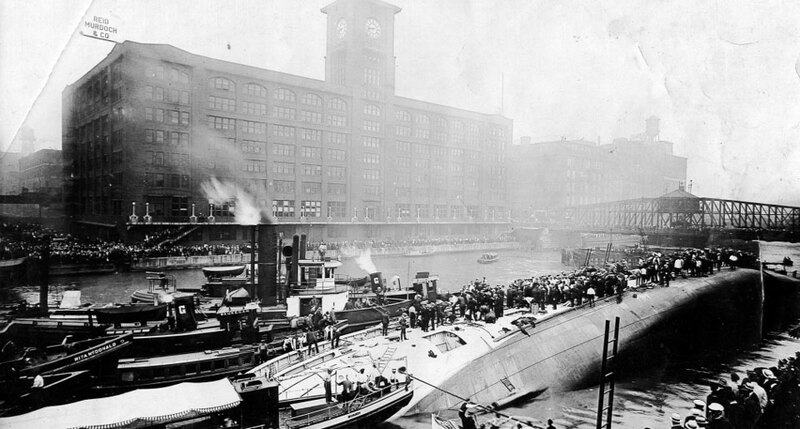 Early on July 24, 1915 more than 2,500 people boarded the S.S. Eastland at the Clark Street Bridge over the Chicago River. The Eastland, known as the "Speed Queen of the Great Lakes," was the largest of five ships chartered to take Western Electric employees and family members on a company outing to Michigan City. The Oak Leaves reported that “…ten Oak Park and Forest Park people were carried to a tragic death. Many Oak Park people barely escaped with their lives...”[ii] Many of the victims were from Berwyn and Cicero, where the Western Electric plant was located. With the lead “a notable act of rescue,” the Oak Leaves reported that Frederick W. Willard of 506 N Elmwood pulled his father to safety through a port hole, “then tied a rope around his waist and plunged back into the water from which he had just escaped, and grasped many of the sinking and was pulled back with them to shore.” A man who assisted said that after saving 60 he fainted and was forced to give up. The article recounts several dramatic stories of survival of local residents. The Eastland, commissioned in 1902 had a checkered history. Design flaws made it unstable, and addition of more life boats and rafts, required by law after the Titanic sank, made it more top heavy. Crowding the upper deck apparently was enough to trigger the disaster. The media and public officials sought legal action but no one was ever brought to trial. Western Electric set up a relief fund and reserved vacant jobs for surviving relatives of the victims. Yes, the Eastland was a dirty bloody job--bah! The poem was considered too radical to be published at the time.